Next Generation “URL/API Test” is Live! Do you love the ease and speed of our URL/API test feature, but wish for advanced features like assertions, variable extraction and file uploads in request bodies? Wait no longer! Most of the request editing features from our API Functional Testing UI have been added to the New Test Create (NTC) Beta. Watch the 30-second video below and read the docs for API Functional Testing to learn the finer points on variable re-use and such. New Relic may have shut-down the “Servers” feature in New Relic APM, but we’ve got you covered with our new integration to New Relic Infrastructure. Overlay New Relic Infrastructure data on Timeline Reports for all test types to see what’s up on the back end. 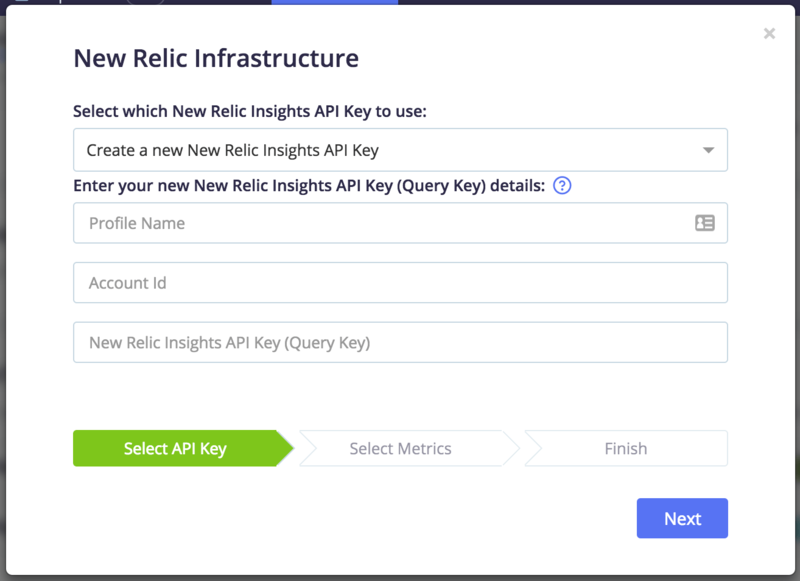 To get started, you’ll need a “Query key” set up in your New Relic Insights account. Full details in our Knowledge Base. By popular demand, test configurations now have a “description” field, where you can document the scope or purpose of your test. No more “LongTestNameTryingToTellTheWholeStory” required! This feature is available in JMeter Test (new), Taurus and API Functional Test flows. We’ve listened to feedback from our single sign-on (SSO) customers who wanted greater control over new user accounts and no more “pile up” of new users in the default workspace. Now you can turn off the “default” workspace, so users can only use BlazeMeter if they have been added to one or more workspaces by an admin. With this option, users who have not been assigned a workspace will get a splash screen asking them to contact the admin for access, instead of landing in a default workspace with full entitlements. Want to add user accounts without depending on email invitations for users to read and respond to? Check! Now you can create and activate accounts entirely from the admin side. Our integration with Dynatrace is now bi-directional! You’ve always been able to send “red dye” (decorated headers) outbound to make test traffic easy to see in Dynatrace and now you can pull Dynatrace metrics inbound to visualize in Timeline Graphs. This is also the debut of Dynatrace support in our new test create (NTC) screens. We’ve made this new functionality available in both our legacy and new test create (NTC) screens. Parameters are now converted to variables, so you can easily populate them with test data from a CSV file. Base URL (default address) and base path (default path) are saved in global variables. 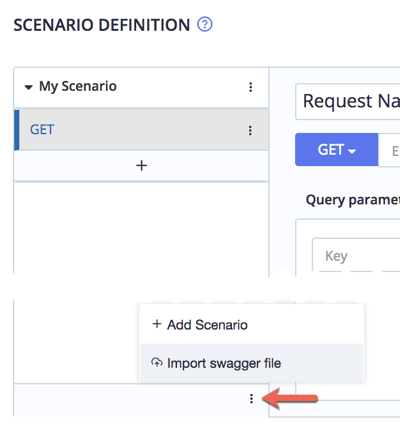 Now you can cancel import of swagger file mid-import if needed. We will deprecate JMeter versions <2.13 on April 29th. When we do, we’ll switch to executing these older scripts with the 2.13 engine. Jump to detailed BlazeMeter reports right from your Bamboo build dashboard with the new BlazeMeter Test Report tab. Use our new intuitive UI to create API Functional Tests with or without writing code. Templates for authentication, variable extraction and dozens of other use cases make it fast and easy, whether writing your first test or your 100th. Prefer to write code? Toggle between the UI and code editor with a click. If you already have JMeter scripts or Taurus YAML scripts, just upload and run them to get detailed functional test results. Watch the animation below or read the help topic to learn more. If you have an unlimited plan, you can now see how many parallel runs are operating across all workspaces in your account. Hover over the green circled number showing tests running in your workspace to see the count of tests running in all workspaces. In the report, we have converted the “Compare” and “Summary” buttons into icons, joining the Accessibility, Share, Refresh and Delete buttons which became icons a few releases back. Now you can run JMeter 4, Java 9 and Taurus 1.10.5 on BlazeMeter. Ever wish you could overlay your own time-series data on the BlazeMeter Timeline Report? We’ll be releasing an API soon which lets you post JSON data to overlay on any test, even in real time. 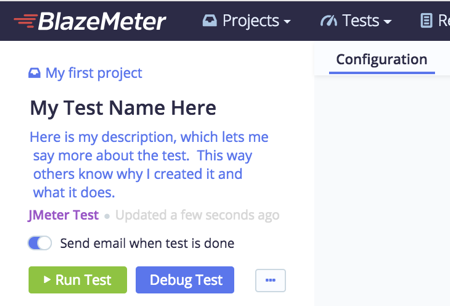 Watch for an update in the next release or drop a line to beta@blazemeter.com if you want to get started right away. In the first five minutes of the test, the graphs show one-second resolution. After five minutes, the graphs switch to one-minute resolution. Starting today, when you press the “Taurus” test create button, you’ll go to the New Test Create (NTC) screen being rolled out as part of our New Test Create Beta. For advanced users who have been running Taurus tests on BlazeMeter for some time, you’ll be interested to hear that the default execution framework is moving from “Taurus V1” to “Taurus V4” with this update. We’ve been gradually rolling out a new test create workflow and underlying test execution architecture since earlier in the new year. Here’s a peek at what we’ve added in the most recent drop. If you have questions about the beta (including requests to join the beta and try it out so you can influence our final builds), please drop us a line at beta@blazemeter.com. The scrolls are “exponential” so that it is easier to configure using them. The test visualization graph now shows a “zoomed in” view of the ramp up period, with ⅔ of the space showing the ramp and ⅓ of the space showing duration of the post-ramp hold period. We added support for the “Limit RPS” setting and “Change RPS” mid-test button. The Debug Test button launches a quick run of your test at low scale to confirm that everything works from the cloud. Unlike the “sandbox test” feature in the previous version, with Debug Test, your settings (such as scale, location or duration) aren’t changed or reset in any way. We also write out a more detailed “trace.jtl” log for these runs to assist with troubleshooting. The validation occurs automatically on file upload and you can re-validate on demand by clicking the “Revalidate” after making corrections/uploading new files.